If you are looking for an amazing holiday dinner this year or any other time you just simply want to amaze your friends and family, then look no further. Gordon Ramsay Ultimate Christmas will bring us on a journey alongside Gordon at home, with his family, as he prepares some of his favorite holiday recipes. On this 2 part BBC America special, Gordon will prepare a stunning array of Christmas dishes including the recipe for his ultimate baked turkey, mouth-watering stuffing, perfectly cooked vegetables and a yummy Christmas dessert. Not only will he show us traditional turkey and baked ham recipes, but also a not-so-traditional holiday take on his beef wellington. Understanding that the holidays can be tight for people, Chef Ramsay has made these recipes with cost-effective ingredients that will not break the bank. Lightly season with salt and pepper then add a generous amount of rosemary to each half. Scoop pumpkin flesh from the top to the bottom until only the outer shell remains whole. Place everything in a blender with a spoon of butter. Blend till even. Preheat the oven to 220 C / 425 F. Meanwhile, prepare the herb butter. Put the butter into a large bowl and season with salt and pepper. Add the olive oil and mix well. Add the lemon zest and juice, crushed garlic and chopped parsley. Mix well to combine. With your hands, loosen the skin on the breast from both ends of the bird so that you will be able to stuff the flavoured butter underneath it, making sure you keep the skin intact. Repeat with the skin on the legs - from the lower side of the breast feel your way under the skin and out towards the leg, loosening the gap. Roast the turkey in the hot oven for 10-15 minutes. Take the tray out of the oven, baste the bird with the pan juices and lay the bacon strips over the breast to keep it moist. Baste again. Lower the setting to 180 C / 350 F and cook for about 2Â½ hours (calculating at 30 minutes per kg), basting occasionally. Transfer the turkey to a warmed platter and remove the parson's nose, wings and tips of the drumsticks; reserve these for the gravy. Leave the turkey to rest in a warm place for at least 45 minutes; make the gravy in the meantime. Remove the bay leaves from under the skin before carving. 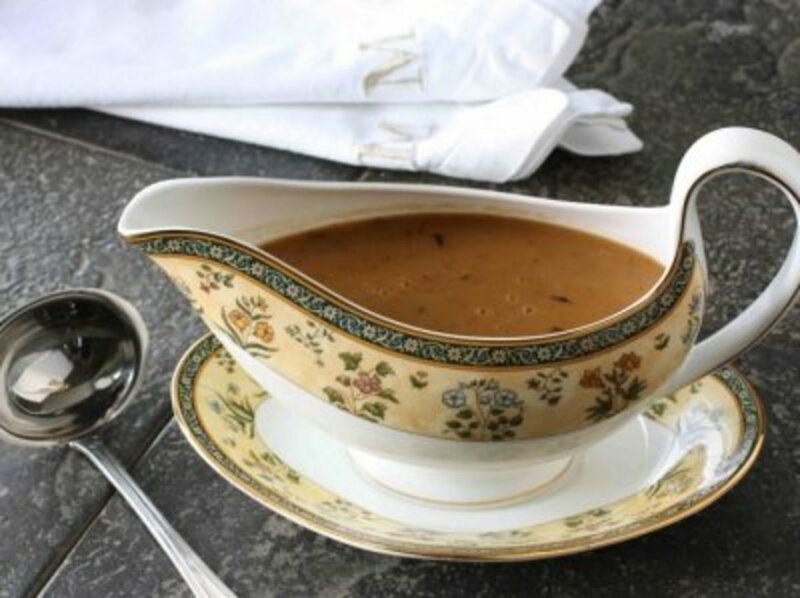 Serve the turkey with the piping hot gravy, stuffing and accompaniments. Full credit for Gordon Ramsay's Ultimate Christmas turkey goes to Chef Gordon Ramsay. Thanks to EM for making this recipe available. Place pork mince in a bowl, season with salt and pepper. 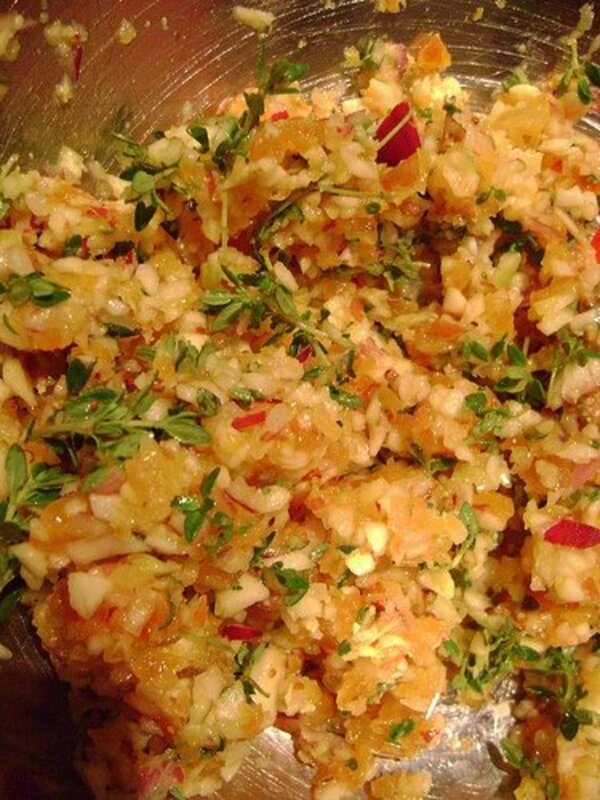 Add grated apple, add chopped apricots, nuts, lemon zest and parsley. Mix thoroughly. On a sheet of tin foil (aluminum) drizzle olive oil, line with sage leaves and season with salt and pepper. Place half of the pork mince meat on top of the sage and make a groove down the center with your finger. Place the spicy sausage inside the groove and cover with remaining pork mince meat. Lift the edge of your foil and roll, being sure to roll it nice and tight. lift back foil to check sage is in right place! Roll and twist the ends while pushing in to make a perfect cylinder. 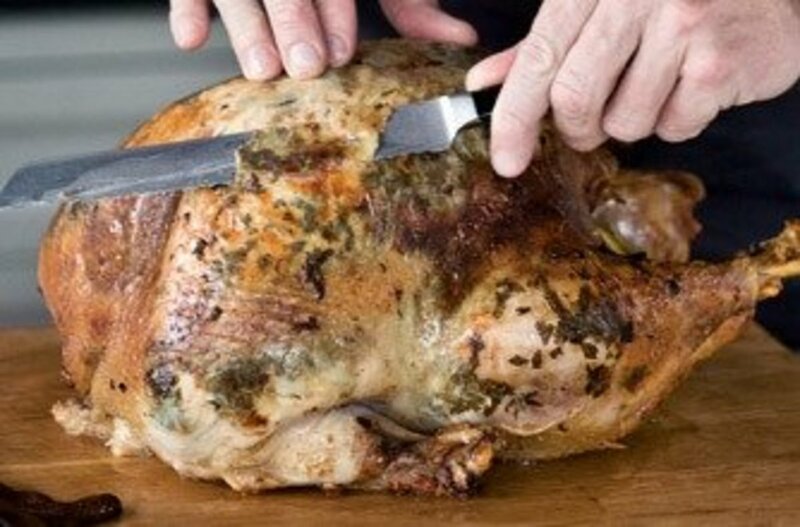 Although not recommended, if you choose to stuff the bird, ensure that the stuffing reaches an internal temperature of 180C/350F to kill any bacteria that may be present. Thanks to Lou Nursey for making this recipe available. Drain the water and let the potatoes continue to steam. Season with salt and pepper. Add chili flakes and tumeric. Drizzle olive oil over potatoes and lightly toss to completely coat. 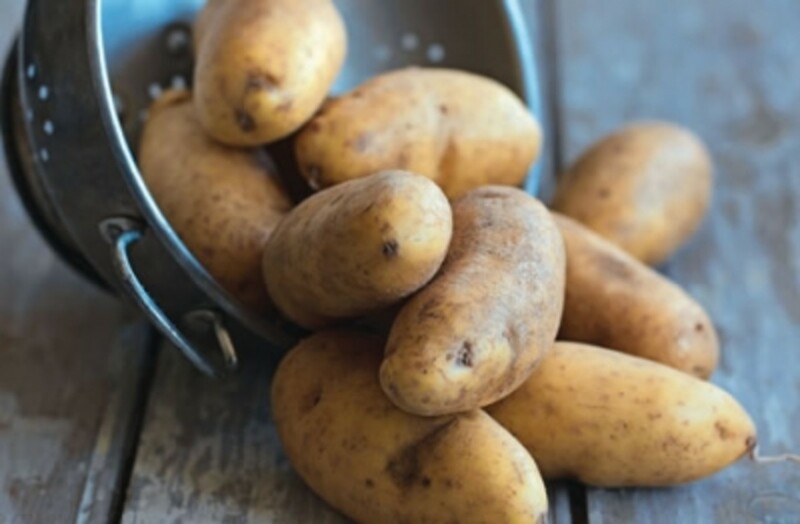 To ensure even cooking, place potatoes flat down on a pre-heated baking tray. Roast at 200 C/400 F for 40 minutes. On Gordon Ramsay's Ultimate Christmas, Chef Ramsay cooked his potatoes and his stuffing at the same time. Placing his stuffing on top shelf and potatoes on the bottom, they were both ready when he wanted them. Chop pancetta (or smoked streaky bacon) and crisp in a hot pan with a tsp of olive oil. Season bacon with salt and pepper. 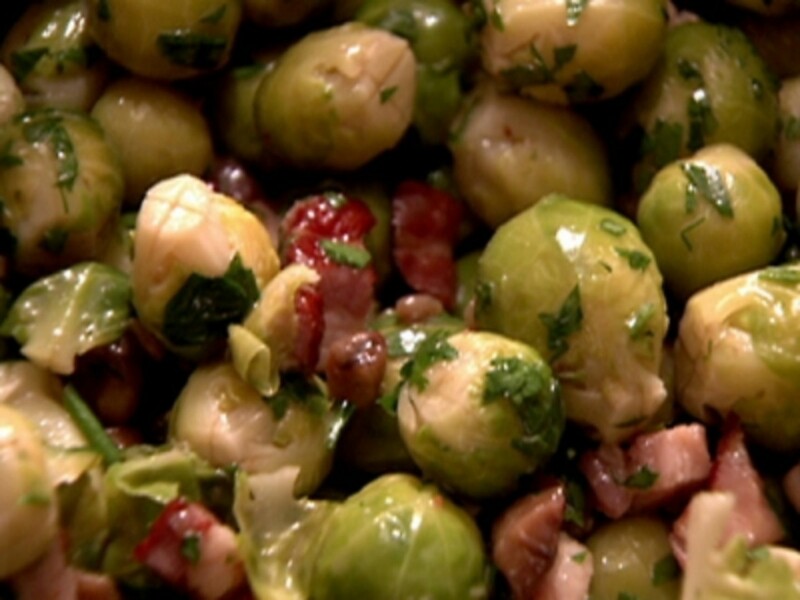 Thoroughly drain the sprouts and carefully add to pan with bacon. Toss. Watch for back-splash. Chop chestnuts and put in the pan 3 minutes before the sprouts are done. Do not add chestnuts too early or they will turn mushy. 10 secs before you are ready to remove the sprouts, add a squeeze of lemon juice. Put in a bowl and serve immediately. If you need to thicken the gravy, simply mix equal weights cold butter and flour together and add this cold roux to the gravy at the end. Mixing the flour with the butter will prevent the flour from clumping. Slowly reheat to boiling to cook out the flour taste. This is an excellent alternative for a cooked roux. Meanwhile, core, peel and thinly slice 2 apples. Add to pan once the cranberries blister. Deglaze with port and add orange zest and juice. Cook for 5 to 10 minutes to thicken. Can be made 3-4 days in advance. Serve cold or room temperature. Pour both creams into a medium saucepan. Lightly bash the mint sprigs with a wooden spoon to release their fragrance and add to the pan. Heat very gently for 5-6 minutes to infuse the cream with the mint. Meanwhile, break up the chocolate and place in a heatproof bowl with the diced butter and honey. Strain the hot cream through a sieve onto the chocolate, butter and honey, stirring as you do; discard the mint sprigs. Continue to stir until the chocolate has melted and the mixture is smooth. Pour the mixture into a wide, shallow dish, cover and chill in the fridge for an hour or until firm. Scatter your chosen coating(s) on separate plates. Take the truffle mix from the fridge and, using a teaspoon, scoop out a portion and shape into a sphere by quickly rolling it in your hands. (Do this speedily to avoid the truffle melting with the warmth of your hands.) Toss the truffle in your preferred coating and arrange on a plate. 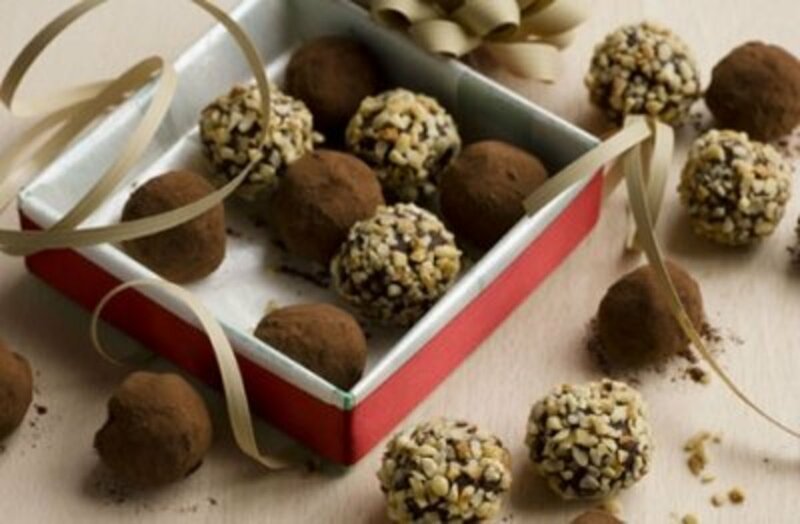 Place the truffles in a shallow plastic container, seal and refrigerate until firm and read to serve. Zest one orange in a lighted buttered pudding basin. Cream together butter and light brown sugar. Pour a few tablespoons of maple syrup into pudding basin and put bay leaves at the bottom. Beat eggs and add slowly to the creamed butter and sugar. In a separate bowl, run flour and baking powder through a sieve to remove any lumps and thoroughly mix. Add ground cloves and pinch of salt. Fold flour mixture into creamed egg/sugar mixture. Pour into basin. Take a piece of baking parchment and cut a circle slightly larger than the basin. You want this large enough to tie it on securely with string. Butter this parchment and place butter side down to the pudding. Cover with Aluminum. Place double cream in a bowl and add Irish cream. Whisk until desired consistency. Use your Kitchen-aid mixer if you have one. To serve, heat whiskey in a pan. Pour the whiskey over the pudding table-side and flambe. Alternatively you may bake individual portions. Adjust your baking time accordingly. i cant get enough of anything Gordon. thank you for so many lovely and wonderful recipes. I like cooking. Nice item. These recipes looks very good. It is surprising how only a little addition can change a dish, I ma making the roast potatoes his way this year for sure. I'm making this turkey for thanksgiving, but I'm going to bbq it. Tried the turkey recipe Christmas 2013, turned out phenom! Love all his shows, demanding in Hell's Kitchen, supportive in Master Chef, bulldozer in Kitchen nightmares, kind and considerate in Master Chef Junior. Although he's a bit of an idiot, I have to admit, he's a great chef with some great ideas! Follow up to the turkey recipe. I am impressed, it tasted amaising. Making the butter lemon mixture and getting it under that turkeys skin was much easier than expected and well worth it. 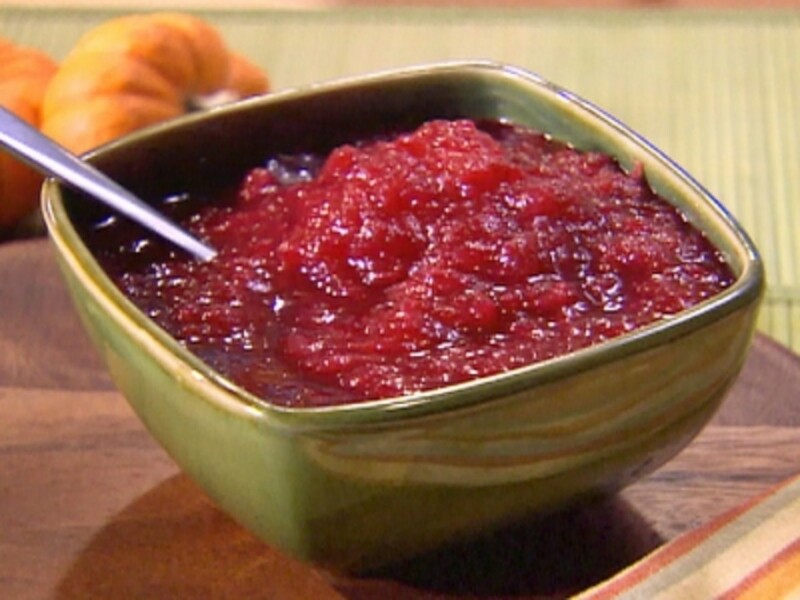 I will also make that cranberry sauce again it is soooooo yummy. @RadaFrancis LM: Rada I'm a newbe to this site and I caught part of the second Gordon Ramsey's Christmas show and was really interested in the salmon recipe. But by the time I got a pen and paper it was gone. Can you direct me to where you accessed the video on this site. Every link I click on doesn't take me to the video or the recipe I'm looking for. Thanks and Merry Christmas. 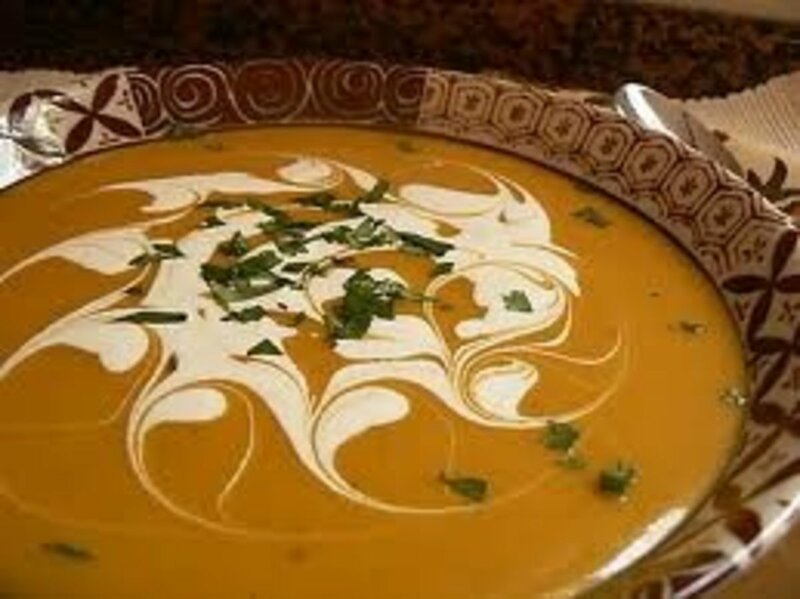 question w/ the pumpkin soup... do you roast/bake the pumpkins open side up or open side down???? I am a big fan of Gordon Ramsay. I love watching any of his shows, but I am looking for the recipe for Gordon's Beef Wellington. It was on Gordon's Ultimate Christmas, Episode 2 and I was unable to catch that episode. Regarding the Roasted Pumpkin Soup, which I'm busting to make, we can't get ham hocks or ham bones at Christmas time in Australia. Can anyone please tell me what I can use in it's place? I'm thinking chicken stock, but the smokiness will be missing), so what else could I add to bring the flavour back to an equivalent with Gordon's recipe?). I watched Chef Ramsay's ultimate Christmas dinners...I thought it was wonderful and now today I am printing some of those wonderful receipes. Ditto on the comment from Ruth. Chef Ramsay you were absolutely wonderful having your kids involved really added to your Ultimate Christmas....Thank you for all the great receipes. I enjoyed the tv show so much I printed all the receipes and will attempt to make them this Christmas. I hope he has more shows like ths one, very enjoyable and great cooking. Ramsey always comes across as a buggar on his TV shows...THIS one is a winner !!! Love the setting, love his friendly attitude, and love, love love the recipes !!!! Happened to catch the show here in Venezuela. and i think i can get my hands on brussel sprouts... interesting recipes and easily done i think... we will try them and let you know!!! Merry Christmas! Feliz Navidad! Wow! I'm not a very good cook, just hamburgers and eggs, but I followed the directions and made the best turkey I have ever tasted and I loved the Brussel sprouts. Thanks Lou for great and easy directions and thanks Mr. Ramsey for delicious meals. I really am inspired to try more. It is funny you should ask about these episodes being made into DVDs. I have been waiting for a long time for it to come out and it finally has. Scroll up to the top and check out the section titled "Buy Gordon Ramsay Ultimate Christmas DVD". I cannot wait until my copy comes in. Gordon sure can cook, gotta give him his props. Thank you so much for creating this yummy lens! :D I'm linking to it on my cookbook-gifts-for-cooks lens. Ah! At last, Brussel Sprouts that taste like good food! (My sister prefers hers from the oven.) However, if you are prone to flatulence, I recommend you substitute some other nut for the chestnuts. Macadamia, pine, almonds might make suitable subs! We tried to mimic this meal for our New Years Eve and I have to say - It was amazing!! Hating brussel sprouts all our lives, not only does me and my husband now love brussel sprouts, so do our children!! The turkey was incredibly moist and the gravy outstanding. Thanks so much for sharing the recipes. It was a fantastic way to celebrate the new year!!! Tried the Turkey, the stuffing, the roast potatoes and the brussel sprouts and the gravy....all was pure magic even though I would have preferred turkey a little bit warmer. Nothing than can't be ajusted second time round. Turkey and Gravy ar a little elaborate yet simple top carry out once you line up all ingredients. Many thanks to the great Gordon who has done our Country proud. GREAT stuff! Much thanks. Only one question...How long are brussel sprouts supposed to be cooked until they've only got 3 minutes left??? I'm really looking forward to some brussel sprouts that taste good, not to mention, great! Love Gordon Ramsay and love having some of his recipes to try-thanks! We are going to make the turkey. It looks sooo good. @anonymous: Hi there, I personally roast my seed whole. Simply rinse them off after removing the pumpkin. Toss them in a sieve and shake the excess water off. Place in a bowl, add your seasoning, place on a flat baking pan at 350F until they are to your liking. Will you have the recipes from episode 2 (beef Wellington, shortbread, panacotta, salmon salad nicoise) before Christmas? Can't wait to try them on Christmas Day! They left my mouth watering!! Can I also get the recipe for the smoked salmon and croissant? Pudding - on this website it says 100g flour - but on the video it says self raising flour ???? He made a ham on the program...he used a cut of pork that I am not familiar with . Can someone let me know, please. Thank you. The 2 part show was fantastic. I am going to try some of these this year. Getting away from stuffing the bird with the usual ..bread etc. The food looked and, as I can only imagine, must have smelled and tasted incredible. Thank you to all of the people that made this site accessible. Will Chef Ramsey be producing a book of Christmas fare?? I will be first in line to purchase!!!! Hi Gordon me and my mom watch every episode of anything you do and we love you're recipes. i am going to make you're christmas pudding and i hope my family will love it too. Made this turkey last year and it was the best turkey by miles. The breast meat was juicy for over 7 days after cooking. Getting ready to cook another one for today and know it will be awesome again. Many kudos to Chef Ramsay and those who put this page together. Like Tim in Vegas said, this recipe was the hit of the holidays and made me the Rock Star! C'mon - when does bacon EVER hurt a dish??? Does anyone have a copy of the episodes? I would love to watch them? One more thing... Whoever put together the gravy recipe forgot to include a step for the Chicken Stock. I reviewed the video and it gets added right near the start. This was the best turkey EVER! Made me a rock star in our house as even the kids that typically don't care for turkey were hovering around at just the smell of it cooking. All of us ate our fill and it was delicious! The gravy was incredible as well. Chef Ramsey if you ever read this, thank you a hundred times over! I tried the mint truffles recipe but it will not firm up enough to form into balls. Possibly because the closest thing we have to double cream in the states is heavy whipping cream. Is there anything I can add to thicken it up? @anonymous: I don't think Gordy is rude....People here in the states are too politically full of themselves and too superficial. If you can't stand the kitchen....and he always give good direct criticisim, flavored with a bit of Ramsay Flare and Fire.....The cursing only makes it better.... I absolutely love him as he is!!! yes roadt them first but add at the end so they don't get too soft (he said something like that in the show i recall) they have to be well cooked or you can get sick from undercooked chestnuts. I will be trying the recipe for Gordon's Christmas Turkey as well as his gravy. Since I have been watching several of Gordons TV programs my cooking as taken a giant leap forward !!! I thank you Gordon, and from all who eat my, now, great cooking !!! should the chestnuts be roasted for the brussel recipe? @anonymous: go to the episode 2 Videos link. You will find it there. Just fantastic recipes! Really want to try them all, but will be trying the Turkey, Cranberry suace, and Gravy this year for sure! Gordon, loved the special. You come through (yet again.) Such an artist. I'm making the entire menu. You also demystified poached salmon. Merry Christmas! 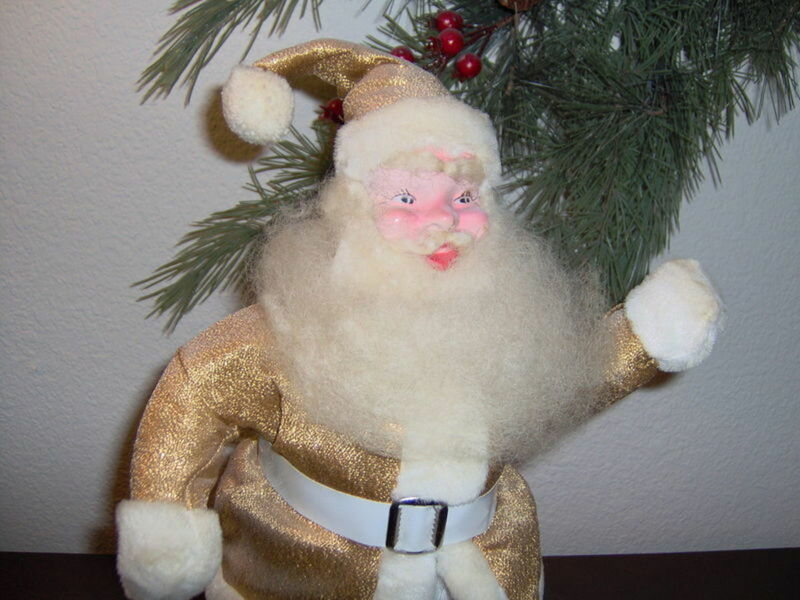 12/22/2010 Hi everyone. I have some Christmas shopping to do today so I will watch and add more recipes tonight. Also I will add episode 2 here tonight as well if it is all available. Thanks a million Lou! I can't wait to try Gordon's recipes for our Christmas Day dinner - thanks to you bringing the recipes to this site. It will be a delightful change from Delia Smith. I am a Brit in the USA also and Christmas and Boxing Day are special gastronomic, family days for us.Merry Christmas everyone! Yay!!! This is so awesome. 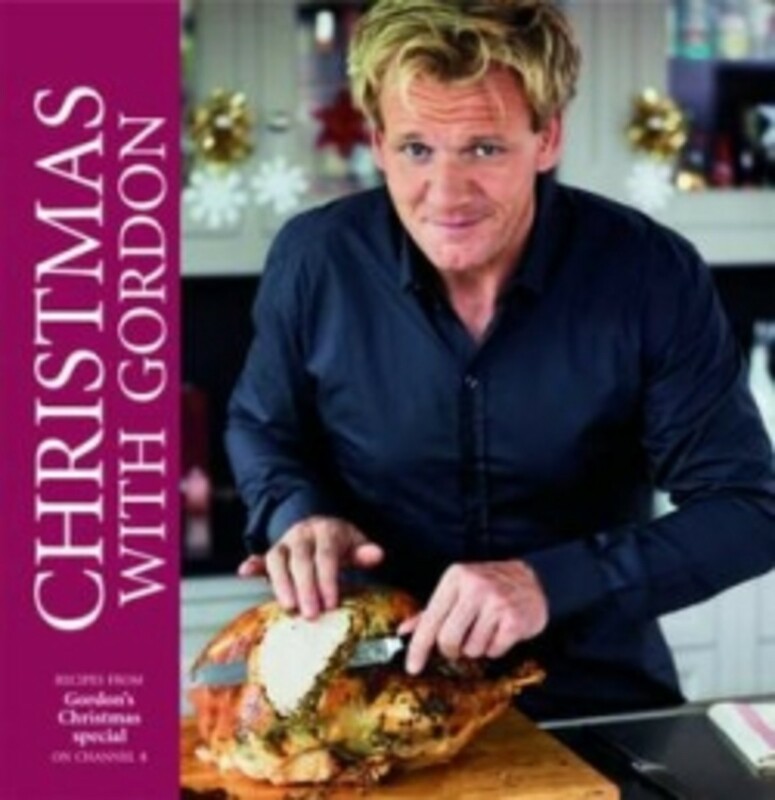 I can't wait to cook my Christmas dinner Gordon style. My Christmas present from my husband is a set of Copper Pots and Pans. So I'm very excited about this. Thanks so much for everyone who made these recipes available. PS. Not to sound greedy.............we will be getting the Episode 2 recipes? Hey Gordon,I watched your show.I Love the poached salmon and pumpkin.I wish that you would not rely on parmesan so much.There is really no need and in fact it's not a great flavour.Very salty and so much fat.Who can taste the mushroom and pumpkin with that cheese?One other thing.Cut the eggs in the shortbread.That's wrong.It has to be made by hand not in a mixer with flour,sugar and butter with a bit of salt. and be pressed into a flan tin.Not rolled. I think this link will take you all to a you tube video.....this is one of 5. This guy has recoreded the whole first episode. :) You're all welcome. Looking forward to tonight. Am DVR-ing the episode, so i guess i'll be a busy Christmas elf, writing down all the recipes for you all to enjoy! You are the best Lou! @dis0bedient: no problem....have posted them. Just waiting for them to be authorized or whatever!!! Does anyone happen to have the gravy recipe? oh forget, with the pudding, to flambe at the table....heat whiskey in a pan, pour over pudding and light! Enjoy! cream together 210g of butter and 210g of light brown sugar. Pour a few tablespoons of maple syrup into pudding baisin and put 3 bay leaves at the bottom. Sieve 100g flour and 3tsp baking powder. Add 1 tsp ground cloves and pinch salt. Fold flour into egg/sugar mixture. Pour into baisin. Take a piece of baking parchment and cut to circle slightly larger than the baisin. (large enough to tie it on securely with string. Butter this parchment. (butter side to the pudding) Cover this with Aluminum. Get a large pan, (put a ramekin on the bottom to sit pudding baisin on) fill with hot water and steam for 1 and half hours....replace boiling water as needed. splash whiskey and irish cream.....whisk till thick or whatever consistency you like. Pepare and cut in half. Blanche in salted boiling water for 2 mins. Chop Pancetta (or smoked streaky bacon) and crisp in a hot pan with a tsp of olive oil. Season with Salt and pepper. Drain the sprouts and add to pan with bacon. Toss. Chop chestnuts....don't put in pan too early or they will turn mushy. 10 secs before you are ready to remove the sprouts, add a squeeze of lemon juice. Put in a bowl and serve immediately. Drain excess fat from roasting juices, put pan on heat. remove onion and lemon from cavity. Chop bacon, onion and lemon, add to the pan. Add sprigs of rosemary and chopped tomatoes to thicken. Remove the wings and other bits that you don't really eat, add to pan. Add Dry cider, reduce, Pour in resting juices from turkey and reduce by half. Mash the veggies into the gravy to release more flavor. Pour in chicken stock. Taste. sorry, do not have exact quantities of cider/chicken stock etc.....i'm sure you all have a good eye....as with all great chefs, go with your gut instinct!!! Dying for the gravy reciepe...does anyone have it yet? I plan to make these recipes! Thank you for posting these, it saves me from replaying his show and start and stopping it to write it all down! Now to convert the grams to lbs and so on! Merry Christmas! Love that Gordy - - great to see him with his Ma and bairns too! I keep telling my US friends he's really NOT that rude -- it's all hype for TV. This type of program shows him at his best! And the recipes are wonderful. Lounursey: Thanks so much for posting those recipes! Since you DVR'd the episode, cold you post the recipes for the Gravy, Brussel Sprouts and Pudding?? I've combed the interenet and no luck. Roast potatoes with Chilli and Tumeric. drop in salted cold water, bring to boil and cook for 8 mins, Drain and let steam. Season with Salt and pepper. Add Tsp Chilli flake and tsp of tumeric. Drizzle olive oil over potatoes and shake to coat. Put potatoes ina pre heated baking tray with olive oil. Roast at 200 degrees for 40 mins. Gordon cooked his potatoes and his stuffing at the same time. Stuffing on top shelf, potatoes on the bottom! @brandonmotz lm: you are welcome! I DVR'd the episode, so i just copied down what he said!!! That is going to make many peoples Christmas dinner a very happy one. Thank you very much! Well we now have these just in time for episode 2 tomorrow. Let the hunt begin again! I have many recipe books by Gordon Ramsey. He runs the ultimate in Clean, efficient and best tasting restaurants I have ever seen. OF COURSE!! I shall try all the recipes in his Christmas Holiday Dinner. Thanks for getting these for me. Happy Holidays to you all!